"Emporion" redirects here. For the ancient trading outposts, see Emporia (ancient Greece). For other uses, see Emporium (disambiguation). 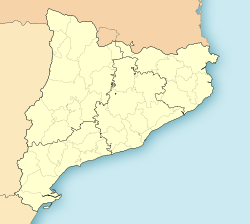 For the medieval county centered on the town of Empúries, see County of Empúries. Empúries (Catalan: Empúries [əmˈpuɾiəs]) was an ancient city on the Mediterranean coast of Catalonia, Spain. Empúries is also known by its Spanish name, Ampurias (Spanish: Ampurias [amˈpuɾjas]). The city Ἐμπόριον (Greek: Ἐμπόριον, Emporion, meaning "trading place", cf. emporion) was founded in 575 BC by Greek colonists from Phocaea. After the invasion of Gaul from Iberia by Hannibal the Carthaginian general in 218 BC, the city was occupied by the Romans (Latin: Emporiæ). In the Early Middle Ages, the city's exposed coastal position left it open to marauders and it was abandoned. Empúries is located within the Catalan comarca of Alt Empordà on Costa Brava. The ruins are midway between the town of L'Escala and the tiny village of Sant Martí d'Empúries. Map of the Ruïnes d’Empúries. Empúries was founded on a small island at the mouth of the river Fluvià, in a region inhabited by the Indigetes (at the present time, the mouth of the Fluvià is about 6 km to the north). This city came to be known as the Palaiapolis, the "old city" when, towards 550 BC, the inhabitants moved to the mainland, creating the Neapolis, the "new city". After the conquest of Phocaea by the Persian king Cyrus II in 530 BC, the new city's population increased considerably through the influx of refugees. In the face of strong pressure from Carthage, the city managed to retain its independent Hellenic character. Political and commercial agreements were concluded with the indigenous population long settled in the nearby city of Indika. Situated as it was on the coastal commercial route between Massalia (Marseille) and Tartessos in the far south of Hispania, the city developed into a large economic and commercial centre as well as being the largest Greek colony in the Iberian Peninsula. From that time onwards, Empúries began to decline, obscured by the power of Tarraco (Tarragona) and Barcino (Barcelona). At the end of the 3rd century it became one of the first cities in Spain to admit Christian evangelists. In that century, too, the Greek town was abandoned while the Roman town survived as a mint and the largely ceremonial seat of a coastal county, Castelló d'Empúries, until the Viking raids of the mid-9th century. Coinage began again under count Hugh II of Empúries (1078–1117). Although the precise location of the town was known since the 15th century, it was only in the 20th century that systematic excavations were carried out. The first official excavations started in 1908 and were held by the Junta de Museus de Barcelona and directed by Emili Gandia i Ortega under the instructions of Josep Puig i Cadafalch and Pere Bosch-Gimpera. These excavations are still going on. 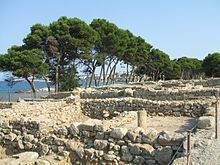 The island on which the Palaiopolis was situated is now part of the mainland and is the site of the mediaeval village of Sant Martí d'Empúries. The former harbour has silted up as well. Hardly any excavation has been done here. After the founding of the Neapolis, the old city seems to have functioned as an acropolis (fortress and temple). Strabo mentions a temple dedicated to Artemis at this site. A mosaic in the Neapolis. "Ηδύκοιτος", "the pleasure of lying down" can be seen at the top. The Neapolis consisted of a walled precinct with an irregular ground plan of 200 by 130 m. The walls were built, and repeatedly modified in the period from the 5th to the 2nd century BC. To the west the wall separated the Neapolis from the Iberian town of Indika. In the south-west part of the city were various temples, replacing an older one to Artemis, such as a temple to Asclepius, of whom a marble statue was found. In the south-east part was a temple to Zeus-Serapis. The majority of the excavated buildings belong to the Hellenistic period. In addition to houses, some of which are decorated with mosaics and wallpaintings, a number of public buildings have come to light, such as those in the agora and the harbour mole. In the Roman period, thermae and a palaeochristian basilica were built. To the south and east of the new city was an area that served as a necropolis. Only about 20% of the Roman city has been excavated. The city has the typical orthogonal layout of Roman military camps, with two principal roads meeting at the forum. The Roman city is considerably larger than the Greek one. During the Republican period a temple was built dedicated to the Capitoline Triad: Jupiter, Juno, and Minerva. During the reign of the emperor Augustus a basilica and curia were added. In the eastern part of the town a number of large houses have been excavated, with an inner courtyard, numerous annexes, floor mosaics, and paintings. In the 2nd century the town was surrounded by a wall without towers. An amphitheatre and palaestra were built outside the wall. The necropolis of Empúries remained in use for a very long period, from the 7th century BC up to the Middle Ages, but many tombs were looted. Martín Almagro Basch wrote two books collecting all data on the majority of cemeteries in the area. There are four types: early Greek and Iberian, late Republican, early Roman Empire and late Roman Empire. Burials were located in the southern and western sides of Neapolis. The western sector was occupied by the so-called necropolis of the wall northeast. Inhumation (Greeks) predominated while a third of burials were cremations (Iberians). The ancient necropolis remained in use with inhumations and cremations, possibly Greek and indigenous from the Neapolis. Cremations predominated in another group, possibly of Roman origin, whose cemetery is located on the north side of the neighboring hill of Les Corts, located southwest of the city. This necropolis was in use particularly during the 2nd and 1st centuries BC. Archaeologists found small mounds built with square blocks of stone with the remains of cremation in the middle. No burials have been found clearly from the second quarter of the 1st century BC until the reign of Augustus (about 35 years). Cremation burials then predominated until the reign of Emperor Flavian (at the end of the 1st century AD) around a hillside where the Roman city is located. Burial rituals changed in the 2nd century AD, with only inhumations found. Precise chronologies are hampered by the lack of grave goods in tombs. The whole area of the ancient Greek city was filled with inhumation burials, perhaps related to the worship of the early Christian basilica or Cella Memoria, situated there. Burials are also in many of the ancient necropolis of earlier times (as Bonjoan, in use for a thousand years) and in new ones. It is possible they were related to the Roman villae located near them. There is a monument of El Castellet and nearby tombs. The branch of the Archaeology Museum of Catalonia in Empúries (MAC-Empúries) strives to offer visitors a thrilling, enriching experience in direct contact with the archaeological remains there. A visit to the Greek city – the only one still conserved in the Iberian Peninsula – and the Roman city are complemented by a tour through the museum, which showcases representative objectives from the history of the site that have been uncovered in the more than 100 years of excavations in Empúries. The museum has good car parking facilities and the site may be reached by a traffic-free coastal walk from L'Escala. ^ Though they later became separate, the Frankish counties of Empúries and Peralda were always held by a single individual, according to Stephen P. Bensch, ("Lordship and coinage in Empúries," in The Experience of Power in Medieval Europe, Robert F. Berkhofer, Alan Cooper, Adam J. Kosto, eds. 73-, p. 74. ^ Martín Almagro "Las Necrópolis de Ampurias I: Las Necrópolis Griegas" Barcelona 1953 y Martín Almagro "Las Necrópolis de Ampurias II: Las Necrópolis Romanas e Indígenas. Barcelona 1955. ^ Alfonso López Borgoñoz "Distribución cronològica y espacial de las necròpolis ampuritanas" en VV.AA. "De les estructures indígenes a l'organització provincial romana de la Hispania Citerior" pp. 275-298. Institut d'Estudis catalans. Ítaca. Barcelona, 1998. ^ Alfonso López Borgoñoz "Las necrópolis altoimperiales ampuritanas" pp. 711-744. Annals de l'Institut d'Estudis Gironins. Vol. XXXVII, 1996 - 97 Girona, 1997. ^ Josep M. Nolla; Jordi Sagrera "Ciuitatis Impuritanae Coementeria. Les necròpolis tardanes de la Neàpolis" Girona: Facultat de Lletres de la Universitat de Girona, Girona, 1995, 329 p. Estudi General, 15. and Josep M. Nolla "Tombes i cementiris del sector nord-oriental del turó d’Empúries" Arqueologia AIEE, Figueres, 33(2000), pàg. 11-20. ^ Generalitat de Catalunya. "Visitmuseum · Archaeology Museum of Catalonia - Empúries". Visitmuseum. Agència Catalana del Patrimoni Cultural. Retrieved 28 August 2017. Wikimedia Commons has media related to Empúries. This page was last edited on 18 February 2019, at 21:00 (UTC).